Congratulations and happy birthday to The Floridian which will be turning 2 this weekend. Be sure to join in the fun at their Birthday Extravaganza 2012 on Saturday, September 1 and Sunday, September 2. Everyone is invited to help them celebrate and you can visit the floridianstaug.com for more info. If you’ve never been, they’re located at 39 Cordova Street and you should check it out. Live music lives on at the Concerts in the Plaza series and this Thursday brings you Lonesome Bert & the Skinny Lizards with their first appearance on this stage, followed by an “after event” at Plum Gallery on Aviles Street. The series ends on Labor Day with the music of the John Thomas Group with ET Swing and Friends. Shows start at 7pm – bring a chair and a friend and hope for good weather. City resident and Director of the Crisp-Ellert Art Museum Julie Dickover is pleased to present “Before and After 1565,” an exhibition and project organized by Portland-based artist Harrell Fletcher. A participatory examination of St Augustine’s Native American history produced by Fletcher and members of the local community, the event includes a museum exhibition as well as a trolley tour of local sites related to our indigenous and Native American history. The project opens Friday, August 31 with a talk, reception and tour, so please visit Flagler.edu/crispellert or call 826-8530 for more information. The downtown shop, “Fresh Produce” will have its clothing featured at the monthly Casa Monica Fashion Show being held on Wednesday, September 5. The guest model will be Alison Johnson, Director of Development for the St Augustine Youth Services and she will be happy to answers questions and provide information about the upcoming new homes for boys. Tickets for show and lunch are $19.95 and you can reserve your seat at 810-6810. First Friday Art Walk is always fun but there are two events you don’t want to miss next Friday. 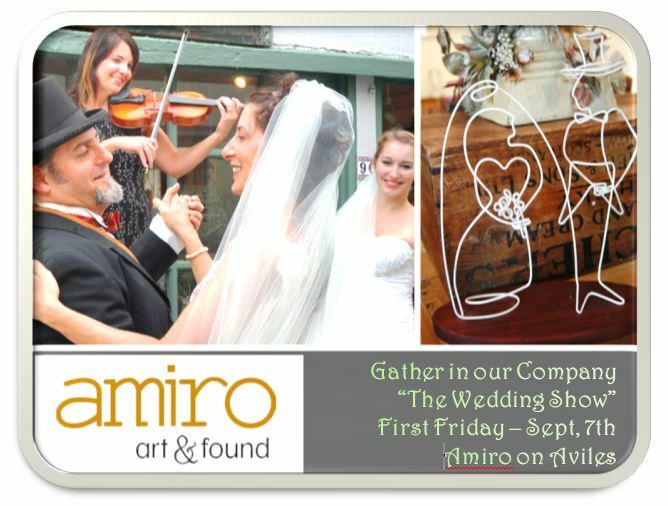 Amiro Lost and Found is hosting “Will You Marry Me … Again,” a wedding showcase featuring an eclectic collection of work from over 22 artists and wedding service providers. During the September 7 Art Walk, a vow renewal between Robert O’Leary and Rebecca Faunce officiated by Dana Workman will commence at 7pm and refreshments include Brooke Butler’s organic wedding cake and popcorn snacks by Pop N Off. Artists and wedding merchants include Toni DeWitt, Jeanette Pacetti, Wendy Mandel McDaniel, Jan Master, Kathryn Carr, Deane Kellogg, Ginny Bullard, Daniel Thompson, Marcia Siary Myrick, Gloria Danvers, 57 Treasury, Cheryl Miner, Kathy Marsh, Steve Lohman, Steve Marazzo, Reanna Franklin, Laurel Baker, Jack Merwin, Estella Fransbergen, Kevin Lang and Deb’s Decadent Desserts. The festivities start at 5 and run through 9pm, so grab your sweetie and go. Before or after you’ve renewed your vows at Amiro, make sure to visit the St Augustine Art Association where Elyse Brady invites you to the new show “Renaissance Man: Thomas Glover W Retrospective Exhibit.” The recent loss of this talent has left us with a void but your spirits will be lifted with this featured exhibition of Thomas’ myriad of works, including paintings, drawings, musical instruments, manuscripts, poetry, photographs, portfolios and his iconic sculptures that can be found locally gracing galleries, City Hall at St Augustine Beach and the collection at the St Augustine Sculpture Garden. Curated by his wife, musician and sculptor, Marianne Lerbs and Kevin Lang, the show promises to be as compelling as the man. The opening runs from 5 to 9pm on during First Friday on the 7th. Stay tuned for news of a September 30th event at the St Augustine Sculpture Garden where Lonesome Bert & the Skinny Lizards will have you dancing with the sculptures. Lorna MacDonald invites you to dinner and a show at the Raintree Restaurant on San Marco Avenue. “Check Please” by Jonathan Rand is being performed on August 30 and 31, September 7 and the 14th and you can get more information and make reservations at raintreerestaurant.com. On September 8th, everyone is invited to the 447th anniversary of the landing of Don Pedro Menendez de Aviles and the founding of St Augustine. Starting at 10am and being held on the grounds of the Mission Nombre de Dios, admission to this heritage event is free and all are welcome to attend. Reenactments, a proclamation, a celebration of Thanksgiving Mass by Bishop Felipe J Estevez followed by a Grand Procession, presentations and the display of the newly restored casket headboard depicting the ancestry of Menendez are among the activities of the day. Finally, hats off to Yvette Schindler of the Present Moment Café at 224 West King Street on her new recipe book, “Handmade in the Present Moment.” The book signing was last week but you can find the book at the Café or through the website at thepresentmomentcafe.com. Stop by to say congratulations and while you’re there you can have a delicious bite to savor. I see all kinds of new signs and new faces downtown but I need your help in keeping up with them all. If there’s something you’d like people to know about, please drop me a line at arriola.Irene@gmail.com. Happy Labor Day to all. Amiro Art and Found is located at 9C Aviles Street. The gallery is open Thursday through Monday from 11:00a.m to 5:00p.m. with extended hours on Fridays and Saturdays until 7:00p.m. 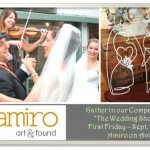 For more information call 904-824-8460 or visit www.amiroartandfound.com.